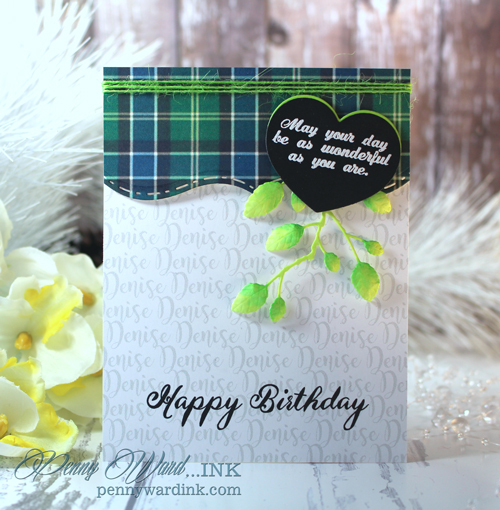 Denise's *Happy Birthday* blog hop + stamp giveaway! Make sure to leave a Happy Birthday wish on the last stop of the hop. Using the brand new stamp + die set In Your Heart, I cut two hearts and layered them. Background is just a matter of typing her name in a scripty font several times and printing in light gray ink from the computer. 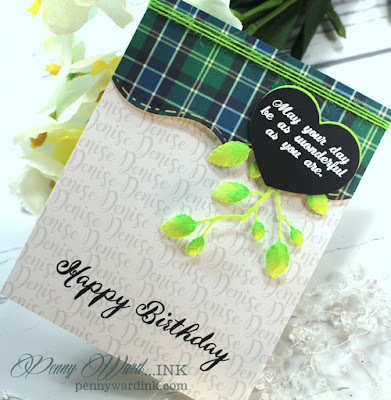 Adorable plaid papers and a die cut stem inked with lime green. Birthday greeting from the Born Yesterday stamp set. If you haven't seen the stamps at The Project Bin, there is truly something for everyone! Whether it's sweet and inspiring, or whimsical and fun, The Project Bin has it all - perfect for all your card making needs. One winner will be randomly selected for the prize! If you encounter a broken link, or need to start at the beginning click HERE. Very Cute--I love your personalized background! Oh, wow, Penny!!!! What a way to personalize a birthday card!!!!!!! LOVE that background! 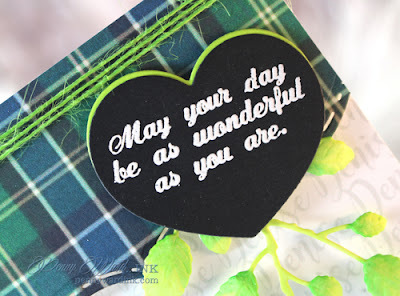 Absolutely love the font on the birthday sentiment and great idea to use the die from In My Heart!!! Fabulous card!!! Oh my, Penny - this is outstanding! What a creative idea to go with Denise's name - brilliant! Happy to have you on the hop and thanks for sharing your amazing birthday card! Hugs! That little dab of bright green just MAKES this card! I love it! Wonderful b-day for Denise, you did a great job with the name background. 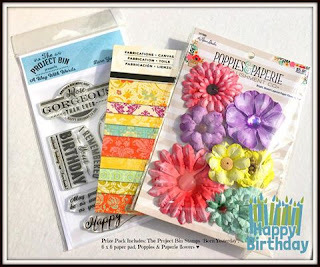 Great blog hop, and the card is beautiful, love the top die you used, and the background...awesomeness! Penny, I love this so much!! Thank you!! Wow! Wonderful card! Love Denise's name in script for the background. Great shape at the top of the card! And great name for your grandson...Declan is my sons name too! I simply adore your card. Just genius to put Denise's name in gray in the background. Great card. How ink-genious to repeat Denise's name in the background! ohh lala...so thoughtful! This card is just the cutest. I love how you personalized the card. I totally have to remember this! This is great Birthday card. I am always looking for unique birthday stamps and dies. I had never been to the project bin before thank you for sharing them! how clever you were to compute Denise's name like that. And your plaid and balloons are perfect. Yay... love to see new clever ideas. Beautiful card with a great color scheme! There are a lot of great ideas used on this card. I love the layout you created! Awesome card! Love that personalized background! Happy Birthday to Denise! I love your beautiful card, Penny! Gorgeous plaid paper and wonderful design!